So you've got one of the new Infiniti G 35/37 s with the dual throttle body setup. Pretty cool, huh? Now it is time to take your Infiniti's air intake system to the next level. Get rid of those boring restrictive air boxes and replace them with the Injen SP1998 Infiniti G35 / G37 short ram air intake system! 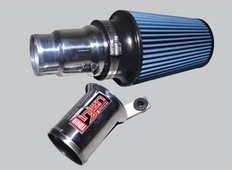 You'll get two top of the line replacement air intake systems complete with heat shielding for more power, more torque, and a great look! New Level Motorsports is an Injen Direct Authorized dealer. The Part number for this item is: IS1950P it fits 2016 Infiniti Q50 (2.0 Turbo Models). We GUARANTEE the LOWEST price on all Injen Products!